When you just need something sweet and simple this crochet flower pattern is just the thing! 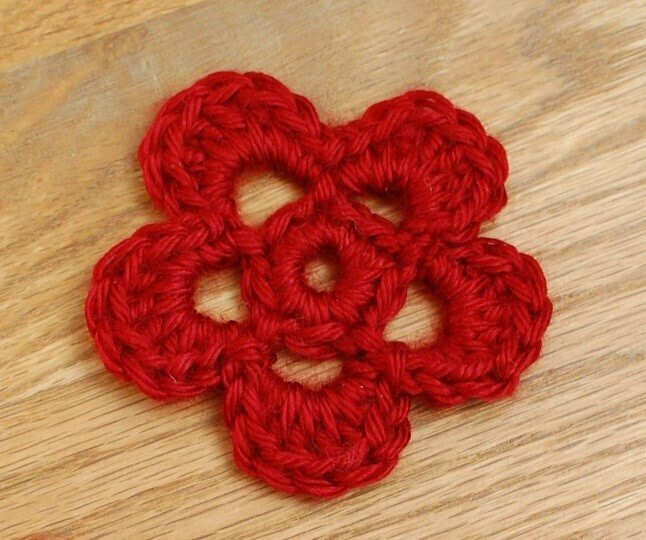 Turn your yarn scraps into pretty crochet flowers … all it takes is three easy rounds! Attach it to a hat, purse, or anything else that needs some extra adornment. See how I used it on this pretty little purse for my daughter here. Ch 4, join in chain furthest from hook to form a ring. Round 1: Ch 1, work 10 sc into ring, joint — 10 sts. Round 2: Ch 5, *skip 1 st, Sl st in next, ch 5, rep from * around, join with a Sl st in same st as last join — 5 ch-5 loops. Round 3: (1 sc, 1 hdc, 4 dc, 1 hdc, 1 sc) in ch-5 loop, *Sl st in Sl st from Round 2, (1 sc, 1 hdc, 4 dc, 1 hdc, 1 sc) in next ch-5 loop, rep from * around, join with a Sl st in same st as last join — 5 petals. That’s it!! Sweet and simple! Click here for more free flower crochet patterns.